Last week I attended an Artificial Intelligence (AI) tour in Finland. During the tour I met senior officials from across European public administrations and heard a number of success stories from AI companies. I also participated in the Ministerial AI Forum 2018 and visited the most intriguing of Finnish AI companies. The purpose of the tour was to offer an overview of Finnish solutions and policies regarding AI and the broader European framework. Last week, we had a busy week that included rules for facilitating free flow of non-personal data and the EU investing £48m to establish the infrastructure needed for the deployment of broadband in remote areas of Sicily. 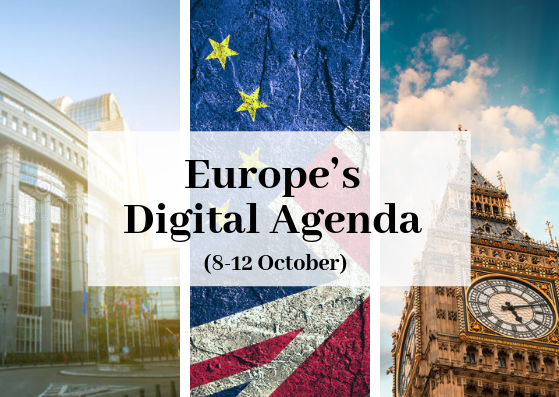 This week, we will talk about the Commission decision to harmonise radio spectrum for Internet of Things (IoT), digital transformation of health care in Europe and the forthcoming Digital Summit in Tallinn. We will also discuss Brexit and the Google decision to appeal against EU’s £3.8bn Android antitrust fine. Heads of government, ministers and tech experts will gather tomorrow in Tallinn, Estonia for the Digital Summit 2018 to discuss the implications of digitisation on governments, economies and societies. This year’s summit will focus on how AI and ‘free-moving’ data can be wielded in the service of digital states, economies and societies. The Commission presented its European approach on AI in April 2018, and is now working with member states on a coordinated plan to be presented by the end of the year. At last year’s summit, EU and European Free Trade Area (EFTA) member states (including the UK) signed the Tallinn Declaration on e-Government that constituted a significant political commitment at EU level to digital public services for citizens and seamless cross-border public services for businesses. The European Commission has adopted an implementing decision to harmonise the radio spectrum for use by short-range devices to facilitate a variety of applications in support of IoT like smart cities, smart homes, smart farming and smart transport systems. The decision wants to counterbalance fragmentation in 874-876 and 915-921 MHz bands across Europe. Radio spectrum waves are the basis for Wi-Fi, mobile phones and other wireless communication devices. At the moment, member states are using these bands for different purposes such as short-range devices or railway communications. Mariya Gabriel, Commissioner for the Digital Economy and Society, has taken part in a high-level round table bringing together public and private organisations around the theme of new technologies in the field of health. The roundtable provided an opportunity to debate key topics such as the upcoming recommendation on the interoperability of computerised record systems and the potential of new technologies such as artificial intelligence and high performance calculation. It was also announced that the European Commission will shortly hear from participants from the pharmaceutical, biotechnology, medical technology and other health-related organisations on its strategy set out in the Communication on Digital Transformation of Health and Health Care presented in April 2018. European ministers and tech experts gathered in Helsinki for the Artificial Intelligence (AI) Forum 2018 to discuss the global race for AI, algorithmic transparency and the need to ‘reskill’ the European workforce. The AI Forum 2018 is a ministerial conference which brings together ministers, political leaders from 22 countries, policy makers, experts and industry to establish a shared European vision for the development of AI across member states and to ensure that the union remains competitive in the age of artificial intelligence. The Netherlands has become the 18th EU member state to sign the voluntary coordination mechanism declaration for the sharing of genomic data for research and disease prevention purposes. The Declaration was originally launched on April 10, during the Digital Day and has since been signed by Austria, Bulgaria, Croatia, the Czech Republic, Cyprus, Estonia, Spain, Finland, Greece, Italy, Lithuania, Luxembourg, Malta, Portugal, Slovenia, Sweden and United Kingdom. UK health secretary Matt Hancock has recently announced an ambitious intention to expand the current UK Genomes Project. Google is set to appeal against the £3.8bn (€4.34bn) fine it received for allegedly abusing the dominant market position of its Android mobile operating system. In its July decision, EU Competition Commissioner Margrethe Vestager accused Google of using the Android system’s huge popularity on smartphones and tablets to promote the use of its own Google search engine and shut out rivals. Vestager said Google had engaged in practices that “denied rivals the chance to innovate and compete”. The Competition Commissioner ordered Google to “put an effective end to this conduct within 90 days or face penalty payments” of up to five percent of its average daily turnover. Google has until Wednesday to file its case with the European Court of Justice against the EU decision. However the PM can expect some support from a number of Labour MPs for a deal that can limits the economic externalities of no deal Brexit. In the meanwhile, UK Brexit secretary Dominic Raab travelled to Brussels on Sunday for a meeting with EU chief negotiator Michel Barnier, as talks for a Brexit deal reach a climax ahead of Wednesday’s European Council summit. Raab said the EU and the UK have made progress “in a number of key areas” in Brexit negotiations, but there remain a number of “unresolved issues relating to the backstop”. Barnier said after the meeting with Raab that they could still not bridge a gap between his backstop demands that Northern Ireland stay in the single market if there is a risk that and hard border with Ireland could revive conflict, and UK’s rejection of any checks on trade between the province and the British mainland. Theresa May has also been briefing MPs in Parliament today. European Commission’s Security Union Task Force and the European Political Strategy Centre, will host a High-Level Conference on ‘Election Interference in the Digital Age: Building Resilience to Cyber-Enabled Threats’. Heads of government, ministers and tech experts will gather tomorrow in Tallinn, Estonia for the Digital Summit 2018 to discuss implications of digitisation on governments, economies and societies.